Or win a PS Vita with all launch titles! We've got all sorts of amazing stuff going on at this year's Eurogamer Expo, but we're particularly pleased to announce this latest pair of competitions courtesy of Sony. Win a €10,000 Uncharted 3 Treasure Hunt in Jordan! Sony wants to fly one Eurogamer Expo 2011 attendee to Jordan (yes, the country) to take part in an Uncharted 3: Drake's Deception €10,000 treasure hunt. The Jordan treasure hunt is part of a worldwide Uncharted 3 competition. Winners from around the world will fly to Jordan for three days in early October to discover, via treasure hunt, the locations that inspired Uncharted 3. You'll be housed in the middle of a desert in an authentic camp resort, and collect gold coins and clues in a race to discover The Lost World and the €10,000 top prize. There will be a party, and developers from Uncharted 3 maker Naughty Dog will be there to chat, show the game and then let you play it. All you need to do to get there is win the Uncharted 3 multiplayer tournament at the Eurogamer Expo 2011. A maximum of 64 people can compete each day, in eight rounds that run every half-an-hour from noon. The winner of each round goes through to a daily final at 6pm. Sign up for the Uncharted 3 competition at the PlayStation Access area at the Eurogamer Expo 2011. Gallery: Follow Nathan Drake to Jordan on a €10,000 Treasure Hunt. Plus! Win a PlayStation Vita & Launch Line-up! One Eurogamer Expo 2011 attendee will also be singled out and given PlayStation Vita plus all the launch games. We don't even know what those are. That's how amazing this prize is. This is a separate giveaway to the Uncharted 3 Treasure Hunt. All you have to do to stand a chance of striking it lucky is be in the audience for the PlayStation Vita Developer Session at 12pm on Thursday, 22nd September. The Vita session will be hosted by Sony Worldwide Studios VP Michael Denny and kicks off a packed schedule of sessions throughout the four-day show. 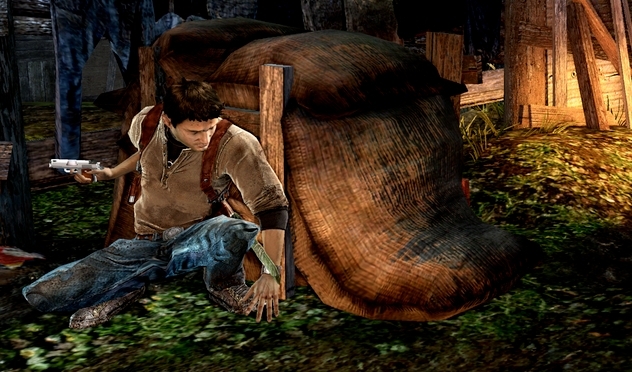 Uncharted 3: Drake's Deception is one of the many games playable on the Eurogamer Expo 2011 show floor this week. Tickets are almost all sold out, but we hope to see you there!